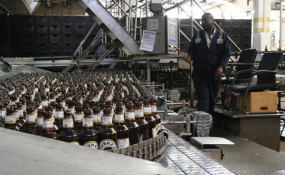 Bottling line at the East African Breweries Limited plant in Ruaraka, Nairobi (file photo). Kasaine ole Partoip is an economist who about a decade ago ventured into farming, growing wheat and barley on a 300-acre field in Mau, Narok County. Like most farmers from his Maasai community, who majorly relied on the community's indigenous knowledge to forecast the weather, Ole Partoip didn't find any reason for not following the community's forecasting knowledge -- it was quite reliable. "In the Maasai folklore, farmers observed the colour of the moon for rainfall predictions," he says. "When the moon was bright it meant the rains were far away while when it was dark it meant that the rains were near and people prepared for farming." But nowadays, the atmosphere has not only become too complicated to predict but most of the long-guarded indigenous knowledge has also become less accurate. For instance, it would sometimes never rain even when the moon was pitch dark, the farmer notes. Sensing drastic changes in the weather patterns -- frequent severe droughts, frosts and prolonged rains -- local large-scale wheat and barley farmers are quickly slashing their acreages to accommodate other crops, a move which is taking a severe toll on beer and wheat flour production. And, as climate change alters wheat and barley farming across the world, beer brewers might need to come up with climate mitigation plans to stop a looming farmers' exodus from the grain farming. "You can imagine that from an acre piece of land where I could harvest up to 25 bags of barley, I can only manage 15 bags at most, translating to a 40 percent yield drop," Ole Partoip says, adding "we are diversifying by reducing acreage under barley to introduce crops such as potatoes, onions and wheat". Statistics show the country's barley production peaked in 2012 with about 72,726 metric tonnes produced that year, but the production has since been on a free fall, dropping to 51,396 metric tonnes in 2015 and 56,084 metric tonnes in 2016. Because barley, beer's main ingredient, is sensitive to extreme drought and heat, climate change will cause undue pain for all beer lovers, a new research suggests. The study published this week in the journal "Nature Plants" warns global warming will lead to substantial decreases in barley crop yields, causing beer shortages and a sharp rise in booze prices. On average, then, global barley yields will decline between three percent and 17 percent, depending on the severity of the weather, the study reported. Dabo Guan, a co-author of the study and a professor of climate change economics at University of East Anglia in Norwich, says that during the most severe climate events, global beer consumption would decline on average by 16 percent, while beer prices around the world would, on average, double. In less severe circumstances, however, global beer consumption would drop by just four percent on average while prices leap by 15 percent, the study showed. "If you still want a few pints of beer -- then the only way to do it is to mitigate climate change," Guan says. "We have to all work together to mitigate climate change." Researchers say people should be worried about the effect of global warming on maize, wheat and rice -- the three most consumed cereals across the globe. Rice and wheat, according to another study, will become less nutritious as carbon dioxide levels in the atmosphere rise, potentially jeopardising the health of the billions of people who rely on the cereals as their main source of food. Scientists have found that exposing cereals to high levels of carbon dioxide results in the grain containing lower levels of protein, iron and zinc, as well as reduced levels of a number of vitamins. The study, published by Harvard University in August, found that many food crops grown in simulated conditions for 2050 saw reductions in protein, iron and zinc levels by between three and 17 percent compared to current levels. The study revealed higher levels of carbon dioxide in the atmosphere are bringing silent, invisible threat: Food crops are less nutritious when they grow under conditions brought about by climate change. This means people would receive fewer nutrients from the food they eat, which could lead to malnutrition. Before the industrial revolution, the earth's atmosphere had about 280 parts per million of carbon dioxide. Last year, the planet crossed over the 400 parts per million threshold; scientists predict we will likely reach 550 parts per million within the next half-century. "Our research makes it clear that decisions we are making everyday -- how we heat our homes, what we eat, how we move around, what we choose to purchase -- are making our food less nutritious and imperilling the health of other populations and future generations," Sam Myers, lead author of the study and principal research scientist at Harvard Chan School, says. Staple crops like rice and wheat, among other legumes, according to other studies have shown a decline in nutrients essential to the body such as vitamin A, vitamin B, iron, zinc, and protein when grown in under 550 parts per million (ppm) of carbon dioxide, which is the level of CO2 emissions scientists expect the world to hit by 2050, based on current emissions rates. Low income consumers may therefore find it a struggle to put nutritious food on the table, while changing dietary habits means that more people are eating food that may be high in calories but low in nutrients, experts say. Studies have shown that higher CO2 levels in the atmosphere could make our food less nutritious, causing zinc deficiency among 175 million more people. Renee Olende, a senior environmental campaigner at Greenpeace, says organic farming could help reverse the impacts of climate change while ensuring high food quality. Ms Olende, whose organisation recently petitioned the Ministry of Agriculture to overhaul the country's food system, says ecological farming will also ensure food diversity and food safety. "The government must carry out a zoning exercise to ensure various crops are grown where they can perform best. This combined with organic farming will enhance food and nutrition security while safeguarding the health of consumers," she notes.